When you need to create an electrical isolation between two flanges, whether it is for the purpose of isolating to offer cathodic protection between dissimilar metals, or to mitigate galvanic corrosion, Pikotek gaskets offer proven reliability. Drinkwater Products has the right Pikotek gasket option for your needs. Pikotek gaskets have a proven track record of integrity, even in aggressive sealing situations and offers a variety of options. The VCFS utilizes Pikotek’s standard VCS design with its 20 plus year track record of success in sealing Very Critical Service. The VCFS kit from Pikotek gaskets is also the number on Fire Safe Insulating Kit in the world. The VCS kit is suitable in all services up to and including ANSI 2500# and API 10,000# classes. The VCS is designed for service where the cost of gasket failure cannot be tolerated. The VCS gasket consists of a PTFE (Teflon) spring-energized face seal, or an elastomeric o-ring, seated in an insulating laminate, which is permanently bonded to a high-strength metal gasket core. Due to its unique pressure activated sealing mechanism, this Pikotek gasket requires far less bolt stress to seal than any other gasket. The VCS gasket inner diameter is exactly matched to the flange bore to eliminate turbulent flow and flange face erosion/corrosion. The seal elements are replaceable in the reusable gasket retainer. the PGE is rated for most all hydrocarbon and water service applications. The unique design of the GPT system incorporates patented overlapping and offsetting seal grooves. The purpose of this design is to break each layer of laminate within the gasket itself thereby creating a barrier through which fluid and/or gas cannot migrate. The sealing element can be any elastomeric material as well as more sophisticated Spring-Energized Teflon lip seals. As a result of this advanced seal design, maintenance-free flange isolation and flange face corrosion mitigation are achieved economically. LineBacker® sealing gaskets utilize a rectangular sealing element, referred to as a “quad” ring, in combination with a unique groove design to effectively seal and isolate flanges of all types. With the unique “quad” ring design, elastic memory is provided for elastomers not normally associated with this characteristic. Materials such as AFLAS, TFE (Teflon) and KALREZ may therefore be used as sealing elements which dramatically increases the options available for matching gasket materials to service and environmental conditions. This greater variety of materials also provides excellent temperature and chemical range compatibility. 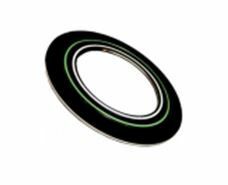 LineBacker® sealing gaskets are self energizing with theoretical near zero “m” and “y” factors resulting in effecting a positive seal without excessive bolt loads required with flat gaskets. Get in touch with Drinkwater Products today for advice or assistance in choosing the best Pikotek gaskets for your needs.